Eggplant (Solanum melongena), known in British English as aubergine, is a member of the nightshade family, related to tomatoes, potatoes and tobacco. It is a perennial in tropical areas but treated as an annual in less warm climates. The glossy purple fruit has white flesh which turns brown rapidly once the fruit is cut. It is classified as a berry and contains many small soft edible, but bitter seeds. Like the tobacco plant, the seeds of the eggplant contain nicotinoid alkaloids. 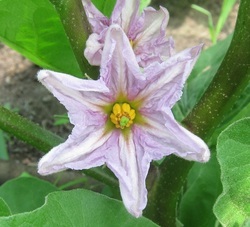 Because it is from the nightshade family, the fruit of the eggplant was at one time believed to be poisonous. The fruit is not, but the flowers and leaves can be poisonous if consumed in large quantities. The skin of young, tender eggplants is perfectly edible. The skin of larger eggplants, however, can be tough and should be peeled. Some people salt the sliced eggplant to draw out the juice and tighten up the flesh. Eggplant is like a sponge for oil; salted and drained eggplant is less likely to soak up oil. Salt sliced eggplant generously and allow it to sit in a colander for at least an hour. Before cooking, rinse well and press the slices firmly between sheets of paper towels to remove as much juice as possible. Another way to reduce the amount of oil soaked up is by using very hot oil to sear the flesh quickly. Fry vegetables in olive oil in a large pan, adding them in the order listed. Season with thyme, basil and oregano to taste. Before serving, melt mozzarella cheese on top. Some people recommend salting the sliced eggplant and letting it sit for 30 minutes to an hour and then rinsing and draining it well before cooking it. If the eggplant is bitter this will draw out the bitter flavor but it is a matter of personal preference. (See the recipe for Grilled Eggplant below). Some people also prefer baking the eggplant slices. Personally, I think it tastes better if the slices are fried in hot oil. Either way, dip the eggplant slices in beaten eggs and then in breadcrumbs. To bake them place them on a baking sheet in a single layer and bake in a preheated oven at 350° for five minutes on a side. To fry them heat oil at least ½ inch deep to 400° (it will cool to 350° when you add the egg plant). Fry them in a single layer, turning once, until they are golden brown on each side. 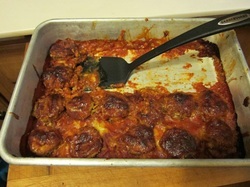 In a 9x13 inch baking dish spread enough spaghetti sauce to just cover the bottom. Place a layer of eggplant slices in the sauce. Sprinkle with mozzarella and Parmesan cheeses. Repeat with remaining ingredients, ending with the cheeses. Sprinkle basil on top. Bake in preheated oven at 350° for 35 minutes, or until golden brown. Moussaka is a traditional dish that originated in the Ottoman Empire. As the recipe spread to the far corners of the empire it was adapted to local tastes and available ingredients. The following recipe is a Greek version. In Greece, moussaka is made by layering sautéed eggplant, potatoes, meat and tomatoes. It is topped with a béchamel (white) sauce before baking and served hot. Heat 3 Tbsp oil in a 6-qt. saucepan over medium-high heat. Add bay leaves, cinnamon sticks, and onion and cook 5 minutes. Add beef and cook until browned, about 30 minutes. Add tomato paste, 1¼ tsp ground cinnamon, ¼ tsp nutmeg, and ¼ tsp cloves; cook about 2 minutes. Add vinegar, sugar, tomatoes, and 1½ to 2 cups water. Bring to a boil. Reduce heat to medium-low and cook uncovered, stirring occasionally until almost all the liquid is evaporated, about 1½ hours. Remove from heat and remove the cinnamon sticks and bay leaves. Season with salt and pepper. Set aside. Heat butter in a 2-qt. saucepan over medium-high heat. Blend in flour. Remove from heat and slowly add milk, blend well. Return to heat and add 1½ tsp salt, remaining cinnamon and nutmeg and milk. Cook until thickened, about 10 minutes. Remove from heat and carefully pour into a blender with eggs. Blend until smooth. Set aside. Heat oven to 350°. Heat remaining oil in a 12″ skillet over medium-high heat. Dust eggplant with cinnamon and fry in oil until golden brown, about 10 minutes. Transfer to paper towels to drain. Set aside. Boil the peeled potatoes until just barely tender. Drain and rinse with cold water to stop cooking. Slice potatoes thinly. Set aside. Spread one cup béchamel on bottom of a 10″ x 14″ baking dish. Sprinkle with ⅓ cup Swiss cheese. Spread potatoes over cheese then a layer of eggplant. Pour the meat sauce over the eggplant layer and spread remaining béchamel over meat sauce. Sprinkle with remaining cheese and bake, uncovered, until golden brown, about one hour. Slice the eggplant, lengthwise, into 1 inch thick slices. Generously season the slices with salt. Place vertically in a colander and let stand 30 minutes. Rinse and pat dry. Preheat grill to medium-high. Liberally brush cut sides of eggplant with oil. Grill, turning once, until tender, about 4 minutes a side. Slice the cherry tomatoes in half and mix them with the walnuts, feta cheese, red-pepper flakes, and 1 tablespoon of oil; season with salt. Spoon over eggplant and top with the basil.